Last month, five Dartmouth students and one recent graduate were informed that they had been selected as 2019 Fulbright scholars. Last night, the Student Assembly presidential and vice presidential debate was attended by over 50 students in Dartmouth Hall. 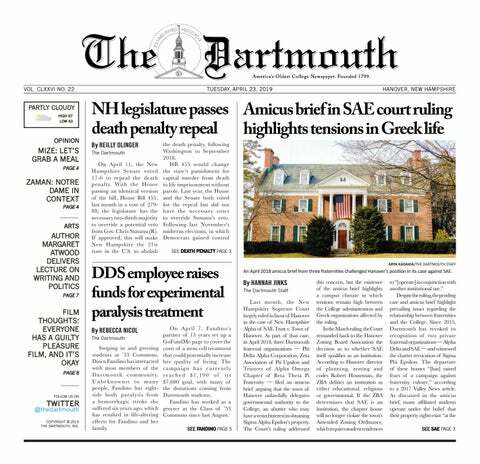 In late March, the New Hampshire Supreme Court delivered a ruling on New Hampshire Alpha of SAE Trust v. The Town of Hanover and the Town of Hanover Zoning Board of Adjustment that largely favored the town. The New Hampshire House of Representatives has delayed consideration of a bill that would allow state authorities to remove guns from potentially dangerous individuals. As the only undergraduates in a pool of 36 applicants, Bill Cui ’21 and Harish Tekriwal ’21 outcompeted faculty members and researchers to win a $5,700 grant from the Arthur L. Irving Institute for Energy and Society, which gave out nine inaugural grants last week. The Institute’s grant will last through the calendar year. This past December was an unforgettable one for 10 students in the College’s War and Peace Fellows program. During a trip to Qatar during winter break, the War and Peace fellows were able to explore geopolitics of the Middle East through high-speed sand duning, peer into the propaganda espoused by Al Jazeera through a first-hand tour of the news channel’s headquarters and further their understanding of U.S.-Qatari relations through conversations with statespeople such as former White House Press Secretary Sean Spicer.